9 POINTS • Canis simensis has a MOVE of 2. Canis simensis males never leave the pack into which they were born. 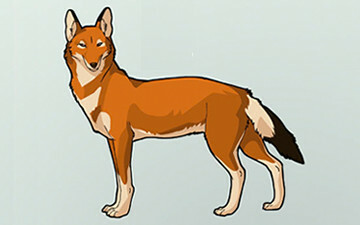 The Ethiopian wolf (Canis simensis), also known as the Abyssinian wolf, Abyssinian fox, red jackal, Simien fox, or Simien jackal is a canid native to Africa. The numerous names reflect previous uncertainty about its taxonomic position, but it is now thought to be related to the wolves of the genus Canis rather than the foxes it superficially resembles. The Ethiopian wolf is found at altitudes above 3,000 metres (9,800 ft) in the Afro-alpine regions of Ethiopia, and is the top predator of theecosystem. It is the most endangered canid, with only about seven populations remaining, totalling roughly 550 adults. The largest population is found in the Bale Mountains in southern Ethiopia, although there are also smaller populations in the Semien Mountains in the north of the country, and in a few other areas. Claudio Sillero-Zubiri at the University of Oxford is the zoologist most closely associated with efforts to save this species of wolf, particularly with his work for an oral rabies vaccine to protect them from the disease passed from local dogs. His work is supported by the Born Free Foundation. A rabies outbreak in 1990 reduced the largest known population, found in the Bale Mountains National Park, from about 440 wolves to less than 160 in only two weeks. Ethiopian wolves live in close-knit territorial packs numbering between 3 and 13 adults, but individual pack members tend to forage alone (2) (3). Afro-alpine endemics such as the giant molerat (Tachyoryctes macrocephalus) and three species of grass rats make up the majority of the diet of these wolves; prey are skilfully stalked out in the open or dug out of their burrows (3). All adults gather to patrol and mark the territory at dawn and dusk repelling any intruders, and rest together during the night, usually spent curled up in the open. Strong social bonds exist between members of the group, who greet each other excitedly (3). Male wolves seldom disperse, whereas many females leave their natal pack at maturity to seek a breeding opportunity elsewhere, occasionally ‘floating’ between established pack ranges (5). The dominant female of each pack gives birth between October and December, to a litter of two to six pups who spend their first three weeks of life inside a closely guarded den (2). Most matings occur with males from neighbouring groups in order to avoid inbreeding (5). Other members of the pack will assist with guarding the den from avian and terrestrial predators. They also regurgitate food for the pups for the first four months of their life, and subordinate females may even suckle the litter (5).